Having been established in 1979, Len Vine Automobiles is a name synonymous with "Prestige Vehicles" of superior quality, that represent outstanding value. 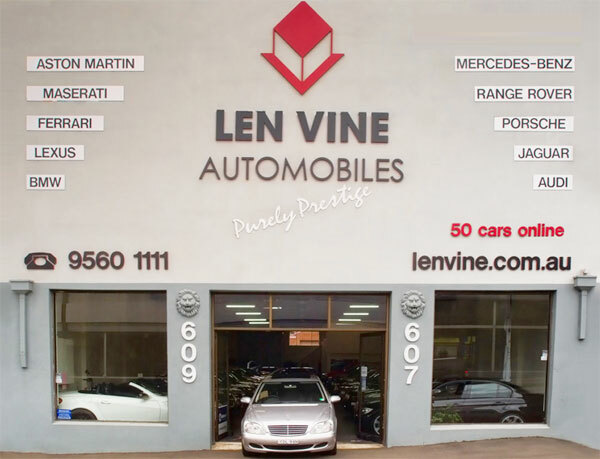 Len Vine is also one of the most trusted dealers in Australia, having sold many thousands of vehicles throughout the country over the past thirty six years. Our vehicles are generally "One Owner" that have been traded on new cars throughout Australia. Naturally they have full service history, and lower than average kilometres. Due to a high turnover, our stock changes on a daily basis so please ensure that you check for updates on our website, or visit one of our two showrooms for personalised service. If you are unable to find a suitable vehicle, please contact us immediately, as we may well have one arriving within a few days, or we will be able to locate one for you quickly.